Fetching Foods is a top quality, nutritionally rich food for dogs and cats. It’s made entirely with high-end, human-grade ingredients. We offer raw, cooked, and vegan options. We are trained pet nutritionists, chefs, and herbalists. We only purchase whole, fresh, organic ingredients from quality supermarkets and distributors. Processing is minimal to maximize the nutritional value of the meal. We never use fillers, preservatives, grains, soy, starches, artificial flavors or colors. It’s 100% natural and lab tested. Our food is handcrafted using locally grown organic produce. Meats come from the USA, Australia, New Zealand and are non-GMO, hormone free, humanely raised USDA certified for humans. Our packaging is recyclable. The food is delivered or shipped directly to your door. Fetching Foods is healthy, delicious, convenient, and environmentally friendly. Kibble, those dry pellets that come in a bag, have only been around 80yrs. Before then dogs and cats thrived on things they caught or could forage. Their digestive systems are still built for raw foods, unable to efficiently to consume today’s pet food. Raw food is the most nutrient-rich, bioavailable, healthy food you can give your pet. Our gently cooked food is the next best thing. Feeding table scraps, cooked food, kibble (dry food), dehydrated, or even canned food, is less nutritious and arguably harmful because of the processing and additives needed to create food in that form. Those foods also place a greater load your pet’s digestive system and other organs like kidneys. Our direct personal experience and culinary training combined with nutritional science has shown clean, whole food changes the health of animals in significant ways. We’ve seen first hand that changing to a healthy raw diet diabetes goes into remission, dandruff disappears, skin allergies (itching) vanish, urinary tract issues evaporate, digestion problems were no longer problems, pets regain energy and vitality, with the added bonus of solid waste dropping to 20% of what it was. The bottom line: diet is a powerful tool when it comes to pet health and longevity. Healthy and happy pets are our motivation. We work tirelessly supplying a fantastic product that helps humans give their four-legged loved ones a healthy, organic, humane, and environmentally conscious diet your pet will devour. We want to do our part to keep your pet healthy, vibrant, and your loving companion for a long time. You can spend your money now on what is one of the best products on the market to keep your pet healthy. Or you can spend your money on vet bills down the road. It all costs about the same in the end. The question is the quality of their life and how long they’ll live. Our Mission is to deliver the best product possible to people who care deeply about the complete health of their animal. The Fetching Foods promise. 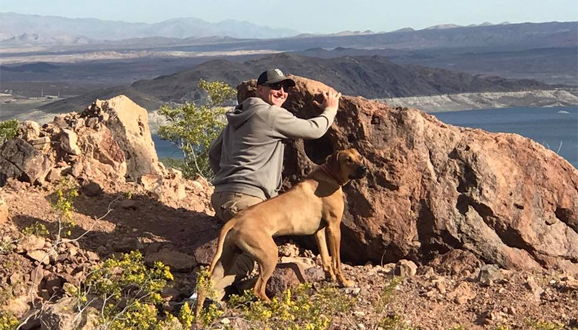 Fetching Foods is located in Las Vegas, Nevada, founded by Troy and Kiesha Allison, both animal lovers with award winning Ridgebacks and an eccentric Savannah cat. Learn more about the motivation behind Fetching Foods here.